This is the concluding disc in the 4-CD collection of Beethoven's complete music for piano trio, recorded live by the Gould Piano Trio in a series of concerts at St George's, Brandon Hill, Bristol. The concert comprising Vol.4 took place before an almost ecstatic audience on 23rd May 2012. 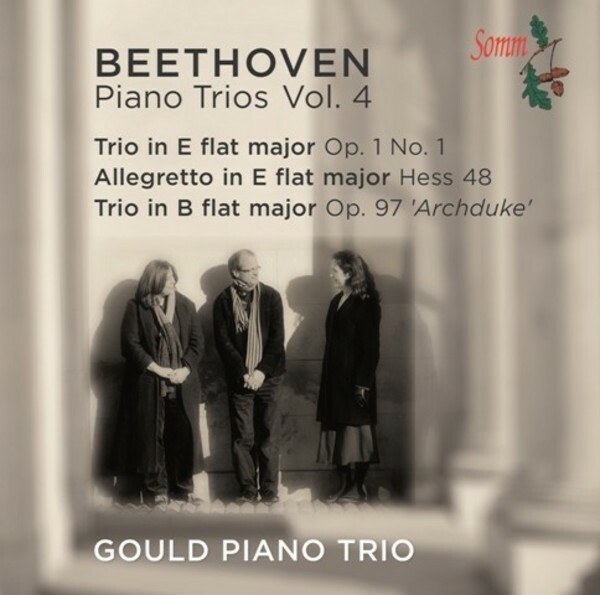 The first three issues have all received glowing reviews, and we end this important collection with a unique coupling which marries the very first work Beethoven wrote for piano trio, the little Trio in E flat, composed when he was 22, with his last - the great masterpiece known as the 'Archduke' Trio, so called because it was dedicated to his patron the Archduke Rudolf, and written 20 years later, which brought Beethoven's immortal series of Trios to an end. Beethoven's 'Archduke' Trio is arguably the greatest such work ever written, and forms a fitting climax to this greatly significant recording project. This very full CD (at just 70 minutes duration) marks the culmination of one of the most important chamber music recording projects by a British ensemble in recent years. This final release in the series will be warmly welcomed by those who have been collecting earlier issues by this immensely gifted team.